By leading the way in system configuration techniques Autoscribe software solutions can match your exact requirements without writing any programming code. This enables Matrix solutions to keep pace with changing business requirements leading to longer system life, lower costs and improved return on investment. Autoscribe Laboratory Information Management Systems (LIMS) enable you to track samples and manage data within many different laboratory environments across a wide range of industries. Autoscribe Business Information Management Systems (BIMS) are used to track assets, staff competencies, documents, actions, helpdesk issues, customer feedback and much more. “Matrix has met and exceeded our expectations"..."The post sales support has been awesome”. "The direct transfer of data into reports using veterinary standard VETXML (an industry-standard computer format for transferring veterinary related data and information) is really useful"
"Matrix Gemini provides a centralized system for data tracking. 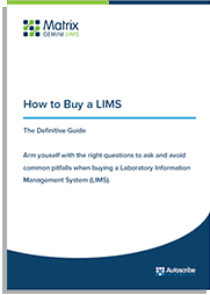 We wanted to be able to track sample items, data, results, status etc., and now we can"
Whether you are purchasing your first Laboratory Information Management System or replacing an existing LIMS this free How to Buy a LIMS guide will help you find the right solution to fit your specific requirements. The Environmental Monitoring module for food safety helps food Companies comply with Food Safety Modernization Act (FSMA) and Current Good Manufacturing Practice (CGMPs) requirements.